Category Archives: The End Is Nigh! Except for the regulatory approval process, Golden Rice was ready to start saving millions of lives and preventing tens of millions of cases of blindness in people around the world who suffer from Vitamin A deficiency. It’s still not in use anywhere, however, because of the opposition to GM technology. Sure – we can arrest people for interfering with scientists’ right to save the world, because scientists are so expert that they know what they’re doing and can absolutely guarantee that everything will work as promised…so that means if they’re wrong, they can be held liable for manslaughter if anyone dies, right? Whaddya mean “that’s not how science works”? 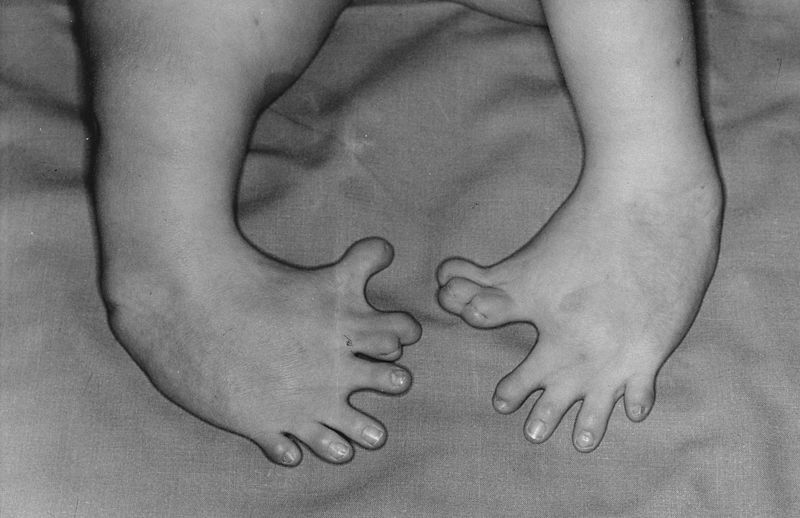 Baby born to a mother who had taken thalidomide while pregnant. Image via Wikipedia. Authority means accountability. If scientists want the one, they should be ready to accept the other. And that doesn’t even touch the issue of whether they are taking too much license with the environment we all share. I hate saying that, because I am not at all a fan of environmentalists, and I hate sounding like them. To me the question is not environment vs. science, but rather the correct way to handle risk. The history of science is full of projects that crashed first and only learned to fly after examining what went wrong the first three or seven or fifty times. Scientists don’t own the environment. We all do. That is why the correct way to win debates over whether or not there is such a thing as “genetic pollution” or whether cross-pollination issues are potentially of concern is by persuading the voters – not by punishing thoughtcrimes, as this writer advocates, by making people criminally liable for invented crimes just because those people and their hard-to-rebut arguments happen to be politically inconvenient. …or just because the scientific community doesn’t know how to effectively rebut a valid point? …or just because the scientific community doesn’t want to even try, because they think people should just obey? Maybe if scientists want to go back to the good old days – when people still trusted them – they could start with an apologize for their own past lack of accountability (which is why people stopped trusting them, after all). Blind obedience hasn’t worked out very well for too many of us. 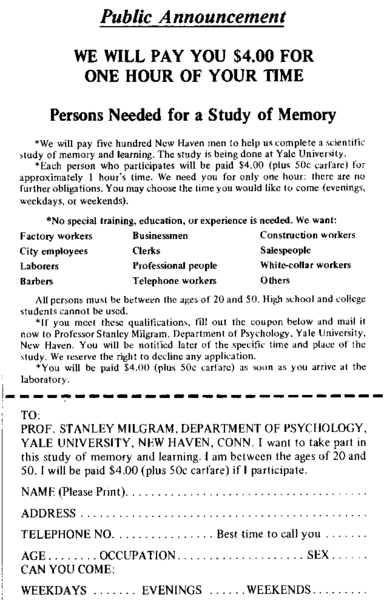 Milgram Experiment advertisement. Volunteers were treated unethically. Image via Wikipedia. The history of science is littered with experiments that were supposed to be safe but wemt wrong. A disturbing number of these science-gone-wrong stories have occurred in the third world. Scientists have a long and ugly history of using developing-world populations as their personal guinea pigs. For example, most people have heard of the Tuskegee syphilis experiment – but how many people know that after it was exposed and shut down, the scientists moved it overseas? Reading this article, it seems that wanting to experiment on third world populations is what this is all about. Poverty isn’t caused by lack of resources. It’s caused by corruption and other political problems. We already have more than enough food to feed the world. So don’t fall for the guy using Third World poverty-stricken people as meat shields: this is not about solving the problems of the poor. It’s about the question of whether scientists promising awesome things have the right to bypass that part of the political process where they have to prove their awesome products are safe and worthwhile – to our satisfaction, not their own. In other words, it’s about self-governance (as opposed to top-down experts telling us what to want, think, feel, need, desire, use, and not use). And the people who want the right to override our political processes – because they are quote-unquote ‘experts’ – have a history of being ethically stunted people who view the developing world as their own personal sandbox for exploitative experimentation. But medical ethicists say that even if today’s research is not as egregious as the Guatemala experiment, American companies are still testing drugs on poor, sometimes unknowing populations in the developing world. “It’s not good enough, in my opinion, to protect only people who live in the developed world — but all human beings,” he said. Ignore or, if necessary, deny the consequences if these grossly exaggerated and highly improbable predictions are incorrect. There is always risk in science – that is why we don’t hold scientists accountable for the deaths their mistakes cause, even though science has caused a steady stream of death and mutilation. We know that science is frequently wrong. The flip side of this is acknowledging that scientists don’t really know, and aren’t honestly in a position to guarantee safety or certainty. Some of the worst atrocities in the history of science come from scientists losing their objectivity – forgetting that they don’t really know. Getting carried away. The honest way to handle it would be to admit that consumers have good reason to prefer non-manipulated foods – and to price GMO foods less, accordingly. But they don’t want to do that. They want to make it so that you can’t tell if a food is GMO or not. They want to replace non-GMO foods with GMO foods.They want to own the food supply. And, no, the fact that they’re willing to forego profits doesn’t mean anything – not when you’re talking about a product with the power to foster dependency and create market dominance. Remember when Nestle gave away baby formula? WHOOPS! If their real goal were to prevent vitamin A deficiency, it wouldn’t be hard to dispense vitamin A to all at-risk populations without forcing farmers into accepting crops that may be wonderful or may cause serious problems. Until Friday, we lived in a world where the West had grown comfortable that Francis Fukuyama was right and history had ended. Events would still happen, but the world would inevitably evolve toward liberal democracy. We all learned in college that liberal democracies were more stable and least prone to violence of all forms of government. Barack Obama, David Cameron, the French buffoon with his mistress du jour, and the rest of the West could sit around tables and worry about the environment, income inequality, unisex bathrooms, and other issues. The West had concluded there were no longer national interests, but global interests where we would all win or all lose together. Hell, just last week the Ninth Circuit ruled that an American public school could ban displays of the American flag lest Mexican nationalist oriented students were offended. It is the foreign policy view of the naive, the rube, and elite in comfortable times. If he’s right, it’s a turning point in our history – that is, the sort of marker historians look for when trying to establish useable boundaries demarcating one historical moment from another (and the sort of thing grandparents want to tell their grandchildren about – and grandchildren later wish they’d listened to more). Hardly a day goes by where we’re not reminded about how robots are taking our jobs and hollowing out the middle class. The worry is so acute that economists are busy devising new social contracts to cope with a potentially enormous class of obsolete humans. Documentarian James Barrat, author of Our Final Invention: Artificial Intelligence and the End of the Human Era, is worried about robots too. Only he’s not worried about them taking our jobs. He’s worried about them exterminating the human race. I’ll grant you that this premise sounds a bit…. dramatic, the product of one too many Terminator screenings. But after approaching the topic with some skepticism, it became increasingly clear to me that Barrat has written an extremely important book with a thesis that is worrisomely plausible. It deserves to be read widely. And to be clear, Barrat’s is not a lone voice — the book is rife with interviews of numerous computer scientists and AI researchers who share his concerns about the potentially devastating consequences of advanced AI. There are even think tanks devoted to exploring and mitigating the risks. But to date, this worry has been obscure. In Barrat’s telling, we are on the brink of creating machines that will be as intelligent as humans…. [O]nce we have achieved AGI [artificial general intelligence], the AGI will go on to achieve something called artificial superintelligence (ASI) — that is, an intelligence that exceeds — vastly exceeds — human-level intelligence. Barrat devotes a substantial portion of the book explaining how AI will advance to AGI and how AGI inevitably leads to ASI. Much of it hinges on how we are developing AGI itself. To reach AGI, we are teaching machines to learn…. … Once a machine built this way reaches human-level intelligence, it won’t stop there. It will keep learning and improving. It will, Barrat claims, reach a point that other computer scientists have dubbed an “intelligence explosion” — an onrushing feedback loop where an intelligence makes itself smarter thereby getting even better at making itself smarter. This is, to be sure, a theoretical concept, but it is one that many AI researchers see as plausible, if not inevitable. Through a relentless process of debugging and rewriting its code, our self-learning, self-programming AGI experiences a “hard take off” and rockets past what mere flesh and blood brains are capable of. And here’s where things get interesting. And by interesting I mean terrible. The problem: the people doing this are powerful, and don’t care what we think. We have no say.They worship science and technology. To them, “reproducing” themselves by creating a race is better than just leaving a son or daughter – and who cares if the rest of the race is exterminated along the way? That just proves the new race – their child – is ‘better’, right? Because, it turns out, ethics really is the line that separates a nice place to live from total nightmare…and reciprocity (the Golden Rule, aka doing unto others as you would have them do unto you) is the key to ethical behavior. …The idea is that packages below five pounds could be delivered straight from Amazon distribution centers to customers within 30 minutes using drones. For now, it seems like half pipe dream, half pseudo-marketing: As many have observed, it probably wasn’t a coincidence that the 60 Minutes segment aired on Sunday ahead of Cyber Monday, the busiest online shopping day of the year — a good time for Amazon to be in the news. Since Sunday’s show, media coverage of Bezo’s plan has overwhelmingly focused on the technical and logistical aspects of Prime Air. For example, will the FAA be okay with all these drones flying around? Are they safe enough to fly around crowded cities and neighborhoods? And can Amazon economically operate what would be a presumably large fleet of drones? And Amazon’s not the only one in this game. The Verge reported that United Parcel Service is researching delivery drones, too. Remember, Google has been experimenting with driverless cars, and is actually running a same-day delivery service in California, so it is definitely interested in humanless logistics, for lack of a better term. I find it a bit disturbing how little conversation there is about the possible negatives of replacing humans with machines for things like delivering packages. A realistic case, according to several specialists, would be automating portions of an existing supply chain that stretches from a factory floor to the companies that ship and deliver goods to a consumer’s doorstep. New technologies are “encroaching into human skills in a way that is completely unprecedented,” McAfee says, and many middle-class jobs are right in the bull’s-eye; even relatively high-skill work in education, medicine, and law is affected. “The middle seems to be going away,” he adds. “The top and bottom are clearly getting farther apart.” While technology might be only one factor, says McAfee, it has been an “underappreciated” one, and it is likely to become increasingly significant. And what about the people who make a living in the back rooms of grocery stores? Should we simply write them off as left behind because machines are more productive? He used the example of a windshield wiper that has enough “intelligence” to operate when it rains, without human intervention, as a model for the kind of systems he is trying to create. That is consistent with a vision put forward by the Google co-founder Larry Page, who has argued that technology should be deployed wherever possible to free humans from drudgery and repetitive tasks. Well, there are a lot of people who earn honest livings from drudgery and repetitive tasks. My father dropped out of school at a pretty early age. But he went to trucking school and learned a skill that allowed him to earn a good living doing something he enjoyed. In fact, he’d still be doing it at 71 if he could get his big belly up into the cab. Nonetheless, as much as he liked his job, he certainly experienced a lot of drudgery and repetition — there was a lot of waking up at 4:00 a.m. to do round trips from Brooklyn to Indiana, and an awful lot of late nights on the road. But would it have been better for that job to not exist? There’s no standing in the way of technological advancement. But we shouldn’t gloss over the inevitable friction that comes with evolution, especially since in this case, the end result looks like a class war. The victims of this relentless innovation in automation will be, at least initially, people who work in factories, for delivery services, and in service industries like retail — not the programmers and entrepreneurs who reap the economic benefits of increased productivity. The good news is that a truly automated world still seems pretty far off. But that’s exactly why we should be talking about it now. What I want to know is if we’re allowed (yet?) to point out that companies like Google and Amazon are dedicated to amassing as much money and power as they can – that is their purpose for being: to control as much as possible. We’re the only checks & balances we will ever have. The jobs problem is with us regardless of whether this particular class of robots comes to fruition. But I’m not real keen on the idea of my nighttime sky being full of whizzing aircraft. And will I get to use drones for my own purposes, too? Somehow I suspect this is going to be more like government-regulated airwaves, only (given current corruption levels) much less accessible: where a few wealthy corporations pay a token fee to ‘own’ things that rightfully belong to all of us. Many of us yearn for a return to one golden age or another. But there’s a community of bloggers taking the idea to an extreme: they want to turn the dial way back to the days before the French Revolution. Neoreactionaries believe that while technology and capitalism have advanced humanity over the past couple centuries, democracy has actually done more harm than good. They propose a return to old-fashioned gender roles, social order and monarchy. You may have seen them crop-up on tech hangouts like Hacker News and Less Wrong, having cryptic conversations about “Moldbug” and “the Cathedral.” And though neoreactionaries aren’t exactly rampant in the tech industry, PayPal founder Peter Thiel has voiced similar ideas, and Pax Dickinson, the former CTO of Business Insider, says he\’s been influenced by neoreactionary thought. It may be a small, minority world view, but it’s one that I think shines some light on the psyche of contemporary tech culture…. …“Reactionary” originally meant someone who opposed the French Revolution, and today the term generally refers to those who would like to return to some pre-existing state of affairs…. …Perhaps the one thing uniting all neoreactionaries is a critique of modernity that centers on opposition to democracy in all its forms. Many are former libertarians who decided that freedom and democracy were incompatible. Exactly what sort of monarchy they’d prefer varies. Some want something closer to theocracy, while Yarvin proposes turning nation states into corporations with the king as chief executive officer and the aristocracy as shareholders…. They are ignoring the problem, of course, which is that there is nothing at all to stop abuse when citizens have no voice. Of course, why would that bother them, anyway? They imagine themselves the kings, not the subjects – a naive thought, but then their expertise is in tech, not politics. To be clear though, pure neoreaction is an extreme minority position that will probably never catch on beyond a tiny cult following. But there has been an explosion of interest since late 2012, despite the fact that Hoppe, Sailer, Yarvin and others have been writing about this stuff for years (and neoreaction’s European cousin archeofuturism has been around even longer). And this interest just happens to coincide with growing media attention being paid to the problems of the tech industry, from sexism in video games to “bro culture” in the tech industry to gentrification in the Bay Area. And many professionals, rather than admit to their role in gentrification, wealth disparity and job displacement, are casting themselves as victims. This sense of persecution leads us to our next neoreactionary theme. Neoreactionaries believe “The Cathedral,” is a meta-institution that consists largely of Harvard and other Ivy League schools, The New York Times and various civil servants. Anissimov calls it a “self-organizing consensus.” Sometimes the term is used synonymously with political correctness. The fundamental idea is that the Cathedral regulates our discussions enforces a set of norms as to what sorts of ideas are acceptable and how we view history – it controls the Overton window, in other words.The name comes from Yarvin’s idea that progressivism (and in his view, even today’s far right Republicans are progressive) is a religion, and that the media-academic-civil service complex punishes “heretical” views. So what exactly is the Cathedral stopping neoreactionaries from talking about? Well, the merits of monarchy for starters. But mostly, as far as I can tell, they want to be able to say stuff like “Asians, Jews and whites are smarter than blacks and Hispanics because genetics” without being called racist. Or at least be able to express such views without the negative consequences of being labeled racist. Speaking of which, neoreactionaries are obsessed with a concept called “human biodiversity” (HBD) – what used to be called “scientific racism.” Specifically, they believe that IQ is one of – if not the – most important personal traits, and that it’s predominately genetic. Neoreactionaries would replace, or supplement, the “divine right” of kings and the aristocracy with the “genetic right” of elites. To call these claims “controversial” would be putting it lightly, but they underpin much of anti-egalitarian and pro-traditionalist claims neoreactionaries make. Delving into the scientific debate over race, genetics and IQ is beyond the scope of this article, but I’ve included some links on the topic in the reading list. It’s not hard to see why this ideology would catch-on with white male geeks. It tells them that they are the natural rulers of the world, but that they are simultaneously being oppressed by a secret religious order. And the more media attention is paid to workplace inequality, gentrification and the wealth gap, the more their bias is confirmed. And the more the neoreactionaries and techbros act out, the more the media heat they bring. The conference I attended in June is the product of Itskov’s 2045 Initiative, which has set itself the goal of transferring “an individual’s personality to a more advanced non-biological carrier.” The side effect of that ability to transfer personalities would be that one never has to die with a body; they would become, potentially, immortal…. …Some supporters of the singularity movement tend to be focused on their personal well-being. At a minimum, they want to live as long as possible so they can live to see the advancements that will make them smarter and better. But the singularity also has a larger purpose to them. Refining humans to perfect living, feeling androids would bring immortality, the reduction of disease and suffering (as we know them from our human position anyway), and the ability to regulate people’s needs in a way that is compatible with a planet and ecosystem that prove time and again to be too fragile to compete with our wanton desires for power, convenience, and dominance. Again, *if* the assumptions of science-the-religion are true. That’s a lot of faith in materialism (naturalism) & Ockham’s razor. Given how often both assumptions have been wrong – and how catastrophic the consequences have been so many times – I certainly don’t have that kind of faith that I’d be willing to replace the human race with androids and just assume the androids are somehow alive, based on the “if the assumptions of science are true, then this is probable” theory of consciousness-as-emergent-property (that is, the belief that consciousness does not exist until certain things happen, and that those certain things happening are what causes consciousness to come into being). Personally, I have no problem with the idea of my identity being defined according to the material in my brain. But my identity is a constructed thing – I know this because I’ve spent my life constructing it. Why should I assume my identity equals my consciousness? Is this why so many pro-choice people act as if they assume that babies are somehow not really people? Chalmers is famous for his commitment to the logical (though, importantly, not natural) possibility of philosophical zombies, although he was not the first to propose the thought experiment. These zombies, unlike the zombie of popular fiction, are complete physical duplicates of human beings, lacking only qualitative experience. Chalmers argues that since such zombies are conceivable to us, they must therefore be logically possible. Since they are logically possible, then qualia and sentience are not fully explained by physical properties alone. Instead, Chalmers argues that consciousness is a fundamental property ontologically autonomous of any known (or even possible) physical properties, and that there may be lawlike rules which he terms “psychophysical laws” that determine which physical systems are associated with which types of qualia. He further speculates that all information-bearing systems may be conscious, leading him to entertain the possibility of conscious thermostats and a qualified panpsychism he calls panprotopsychism. Chalmers maintains a formal agnosticism on the issue, even conceding that the viability of panpsychism places him at odds with the majority of his contemporaries.